One of the busiest men on the Fringe, Ricardo Garcia takes time out from his many performances to tell us about his interactive show, A Compas Flamenco. 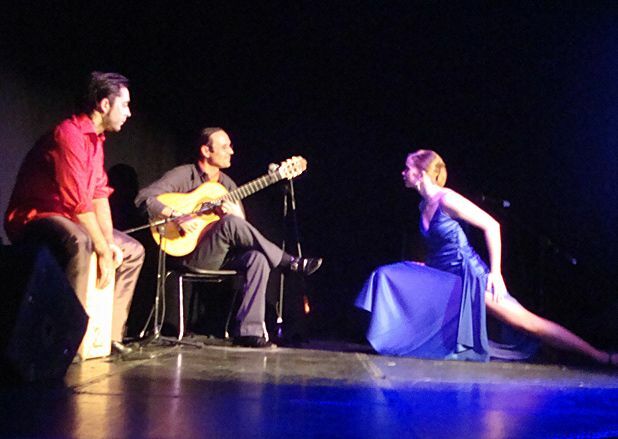 5 things you love most about flamenco? I love the fact that it is the art of the people – not a formal, artificial thing – we have always sung, clapped and played at home around the table, with family and friends; it is truth and passion; it is a combination of elements from many cultures which have come together, but which is also always developing and moving forward. And mostly I love that flamenco touches people deeply – we all have rhythm and we all feel music in our souls. 4 reasons why people should come to A Compas Flamenco? It is a unique opportunity to find out about flamenco – it’s informal, you can ask questions, try out clapping rhythms and stamping steps, see the instruments and accessories and meet the group; the dancers are superb! Both from Barcelona, Frederic Gomez’s dancing has been called ‘one of the wonders of Fringe 2010’ and Aida Gil Garcia is equally talented — a young yet highly eclectic and seductive dancer; we really want to share! We care about spreading the message of flamenco, and we love this chance to connect with people directly. But the main reason is to have fun – you will have a smile on your face and hopefully have learnt a thing or two. 3 favourite things about the Fringe? The people – audiences from all over the world; the performers we know from other festivals (e.g. Movin’ Melvin Brown, Jonno Katz); I love Edinburgh itself – the pubs and the magical walks by the Water of Leith, late-night meals with our group; finally, the extraordinary opportunities that come out of the Edinburgh Fringe – because of it we played in New Jersey on the same stage as Aretha Franklin, and have held workshops in Cambodia, Ecuador, Barcelona – the Edinburgh Fringe changed my life! 2 words to sum up the Ricardo Garcia style? Flamenco flow – that’s why it’s the name of my website! 1 thing you would like people to feel after taking part in A Compas Flamenco? Eager to learn more about flamenco (and inspired to come back later to our 8.30pm formal show at the Bongo Club). A Compas Flamenco, The Bongo Club, 557 2827, 28 & 29 Aug, 2.30pm, £9 (£6–£8).